Facebook and search, there has been said a lot about that topic in the past few years. Could Facebook be a Google competitor? Their search is not good enough for it, but more importantly: people don’t go to Facebook to search, so it doesn’t make sense. The combination between Facebook and Bing makes sense, something they upgraded this week as well (see below). But combining their social elements with search engines could be a very interesting angle. Facebook already has a deal with Bing and Bing is now making their search results more social with the help of Facebook. Another deal which Facebook has now made is with Wolphram Alpha, the knowledge engine based on structured data. It now lets you analyse your personal data on Facebook. We know that Google is integrating Google+ in their SERPS in as many places they possibly can. Because less people use Bing (especially in Europe) less people also know that Bing is doing exactly the same, but then with Facebook. And with more people using Facebook than Google+ that might actually be a lot more interesting. Bing now has added a new feature to their search which incorporates Facebook even more in the search results: you can now search your friend’s photos on Facebook. You can like them directly inside Bing and also comment on them, you don’t have to go to Facebook anymore to do that. 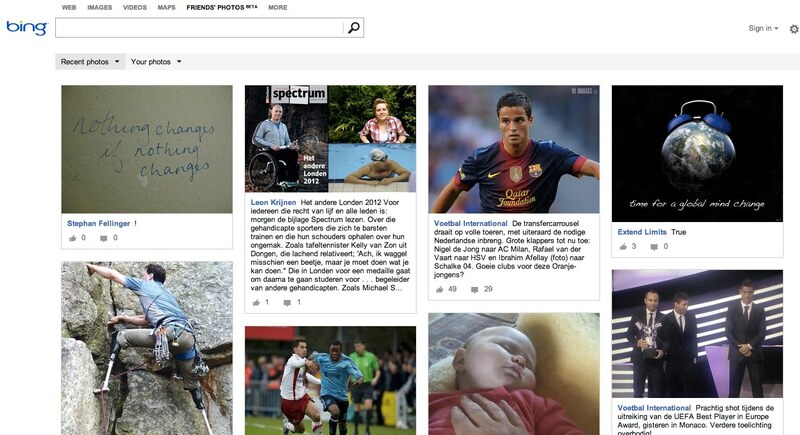 Going to www.bing.com/friendsphotos allows you to directly search into your friends photos. This is next to what you already can see on Bing’s sidebar, which shows friends who have posted photos. Then the deal with Wolfram Alpha. They developed a feature that will allow you to analyse your profile on Facebook. 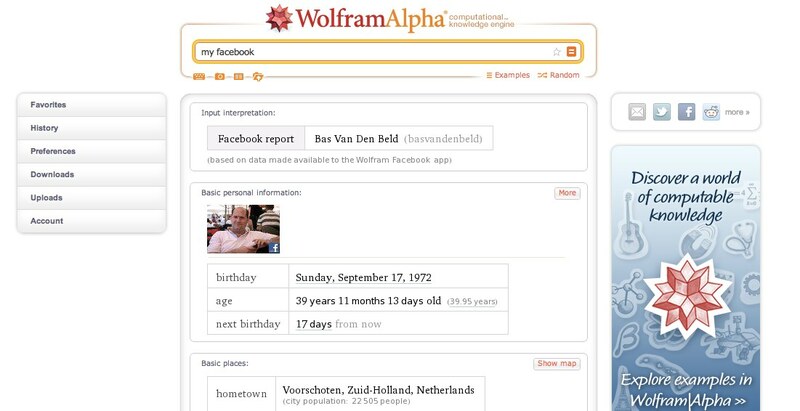 If you go to Wolfram Alpha and type in “Facebook Report” you will be able to connect your Facebook account (given that you have set up a free Wolfram account) and Wolfram Alpha will start crunching data. 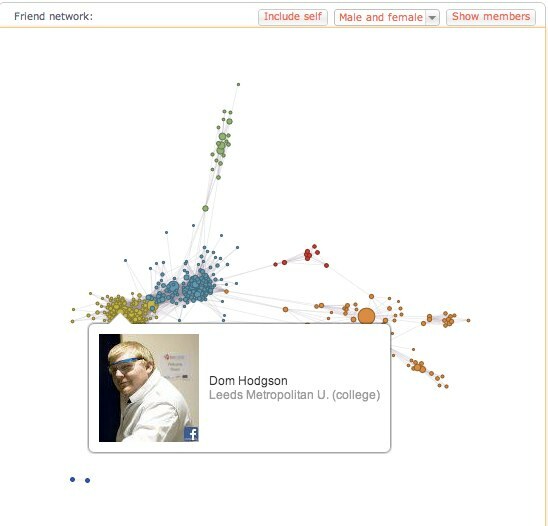 Wolfram looks at when you use Facebook the most, who are your friends who comment the most or share your updates the most and much much more. It is a complete analysis of your profile. So how useful is this feature from Wolfram Alpha? Potentially it is very interesting. There is a lot of data which is known to me already or which I can find on different places as well. But this is a complete overview of me and my friends on Facebook, showing me some interesting statistics that can help me expand my reach. Take for example the graph above. It shows me which people are essential for connections to certain groups and it shows me who is in the centre of that group which makes them sort of an influential. To be honest, this data would really be interesting for connections to Facebook pages or if you could analyse certain people. That would be a very powerful tool when it comes to looking at who is really influential. That however can’t be done at the moment since you need to login with your Facebook account and it would probably also mean the entire end of privacy. Until then it is a nice feature, which I probably won’t be using on a daily basis, but which can come in handy when I want to know how I can best ‘please’ my Facebook friends. To conclude we can say that Facebook is still not getting into search and is not likely to do so in the short term so it seems. In stead it is taking the route of taking their data elsewhere.